As an industry leader in the production and supply of glass, at Tufwell we are continually improving and investing in the technology and equipment we rely on. Our latest investment in a heat soaking machine keeps us at the forefront of our sector and means we can offer an even greater choice of toughened glass products to our customers. Read on to find out more about the heat soaking process, its purpose and when you, as a client, should consider specifying it. Why would heat soaking be needed? 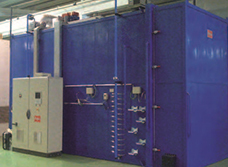 Heat soaking is a process that helps to reduce the risk of spontaneous breakage in toughened glass. To understand the heat soaking process, you first need to understand the basics of the glass manufacturing process.